This climb up Station Mountain begins within Oconee Station State Historic Site then passes through Sumter National Forest on the way to Oconee State Park. Along the way you’ll enjoy the 60-foot Station Cove Falls and a botanical preserve inhabited by beaver. The climb is a good workout, as a peaceful hardwood forest and a well-maintained trail lined with switch cane surround you. This is the western end of the Palmetto Trail, a long distance track that passes from the “Dark Corner” of South Carolina all the way to the coast. Oconee State Park is also the western terminus of the Foothills Trail, another cross country pathway that traverses the Carolinas border. We ventured to the Oconee Passage on Friday, December 12, 2014 between 11:00AM and 2:30PM. The plan was to take the Palmetto Trail from Oconee Station to Oconee State Park, from bottom to top, with a stop to see the waterfall. Hike Rating: Moderate. Strenuous climbing, but only about 1/3 of the distance. Trail Condition: Excellent. Wide track, well-maintained. Easy on the feet. Starting Point: Oconee Station trailhead on Oconee Station Road. Trail Traffic: We were joined by a very friendly State Park Ranger, but only saw a handful of other hikers at the very tail end of our hike. How to Get There: From Walhalla, SC take Hwy 11 to Oconee Station Road and turn left. It is 2.3 miles to the trailhead on the left. You will pass Oconee Station State Historic Site on the right just before the trailhead. There is enough parking for half a dozen vehicles. Originally a military compound and later a trading post, Oconee Station State Historic Site offers both recreational opportunities and a unique look at 18th and 19th century South Carolina. Oconee Station, a stone blockhouse used as an outpost by the S.C. State Militia from about 1792 to 1799, and the William Richards House, are the two structures that remain today. 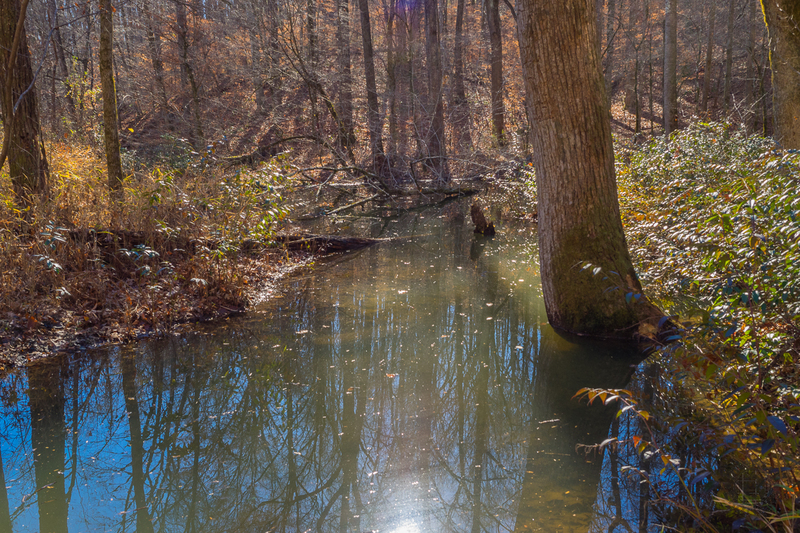 Beyond the park’s historic significance, there’s a fishing pond and 1.5-mile nature trail that connects hikers to another trail leading into Sumter National Forest and ending at Station Cove Falls. That connection was the beginning of our hike. We also had the privilege of being joined by the Oconee Station park ranger, who just happened to be heading the same way we were. So we got a little education from this very friendly fellow, along with our hiking. The trail begins slightly downhill, then follows along Station Creek. You will notice the very obvious signs of beaver activity in the area, and as we passed, the creek was quite swollen from the damming done by Nature’s builders. When you cross the creek on a wooden foot bridge, you are entering Sumter National Forest. Beaver colonies create one or more dams to provide still, deep water to protect against predators, and to float food and building material. The park ranger mentioned at this point that he had never seen Station Creek so swollen. The beavers have obviously been, y’know, busy. The trail is a beautiful, level pathway through hardwood forest that winds along the creek side. Not far past the foot bridge is a spur trail to Station Cove Falls. It’s perhaps a quarter mile up the creek to this 60-foot multi-tiered cascade. The ranger informed us that there is a lot of wildflower activity in this area is Spring, so you may wish to plan your visit accordingly. Station Cove Falls is surrounded by a natural amphitheater that makes for a scenic and playful spot. I suspect this is a popular place in summer as you can walk along the rock slab right to the base of the falls. Just be careful, as wet rock can be very slippery. There wasn’t much water flow the day we were there, but there was certainly evidence to suggest this can be a quite impressive display under the right conditions. Upon returning to the main trail, now your work begins. It is all uphill from here. This is a joint hiking, mountain biking trail, so keep your eyes peeled for bikers potentially coming down the trail. You will navigate a series of sweeping switchbacks that help take the edge off the steepness of the terrain. The ranger told a story of the moonshiners who used to ply their trade up the hollows along Station Creek. Although we didn’t go off trail to look, there are remains of old stills scattered about to this day. We said farewell to the ranger at this point, as he dove into the woods to check out the history himself. As you get higher, you will begin to notice the abundance of switch cane along both sides of the trail forming the ground cover for the deciduous trees. This native species of bamboo is a perennial grass with a rounded, hollow stem. It tends to grow in colonies known as canebrakes. The park people were nice enough to put mile markers along the trail to give you an idea of your progress. When the legs and lungs begin to complain, it’s nice to know how much more endurance you need, especially on your first visit. The trail eventually widens on what used to be known as the old Station Mountain Road. 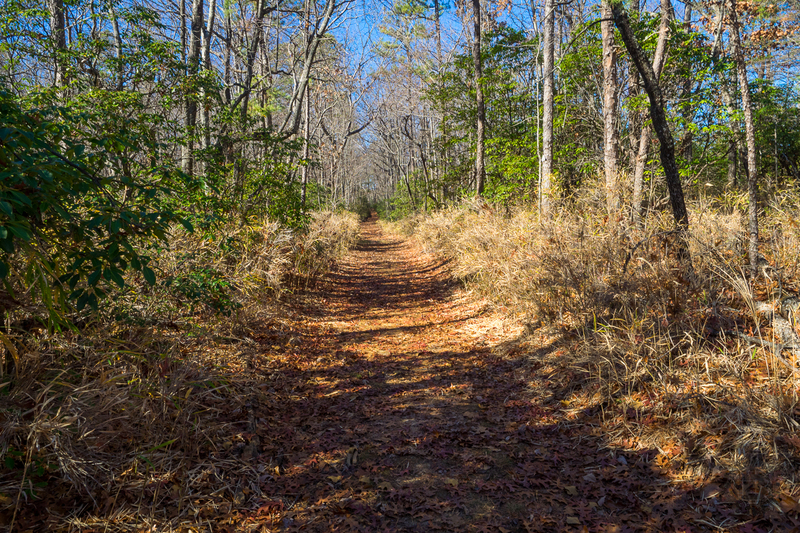 This may have been an Indian trading path during the late 18th century when Oconee Station was established as a garrison. This is the steepest part. I found myself pausing frequently for a 30 second breather. In winter the view through the woods can take your mind off the physical discomfort. With the leaves down, there are views of the surrounding South Carolina Upstate. This “Dark Corner” of South Carolina was perceived as culturally and politically backwards throughout much of the nineteenth century. In particular, the area’s reliance on illicit moonshine as a cornerstone of its economy led to a protracted conflict with State and Federal law enforcement. Coupled with the Dark Corner’s resistance to modernization, the local inhabitants were ostracized and alienated from much of the economic boom of the Upstate in the 20th century. The trail along the Oconee Passage is extremely well maintained, as this stretch along the old Station Mountain Road testifies. Notice the switch cane that lines both sides of the pathway. The trail/road widens even more as it begins to level out at the top of Station Mountain. It is roughly two miles along the total length of this road section of the hike. Eventually you pass the connector to the Foothills Trail, another long distance track that follows mostly along the Carolinas border. In fact, Oconee State Park is the western terminus of both the Foothills and Palmetto Trails. Hang a left at this junction to enter Oconee State Park. It’s back to single track trail now for the last half mile. The trail makes a slight descent as it passes near remnants from old Civilian Conservation Corps activity. It finally pops out to a large parking area with several sign boards that mark the trailheads for the two major pathways that begin here. Ken and I found a comfortable seat for some lunch while studying the various informational boards scattered throughout. One thing we learned was that this Palmetto Trail is the first non-motorized connection between Oconee State Park and Oconee Station at the other end. After a nice rest and nourishment, we began the return trip. This was an up and back hike, so of course most of the return was down hill, a nice relief. When we got back to the car, we made a stop at Oconee Station to thank the ranger for our visit, and his information, and to check out the historic buildings that remain on the site. These 18th century buildings are on the National Register of Historic Places. The ranger informed us that they stage re-enactments periodically on the site, including one that will be coming up in February, 2015. In summary, we had a delightful day at Oconee. We saw a picturesque waterfall, got some great exercise, and learned quite a bit of local history from a very kind and friendly park ranger. Our initial experience with the Palmetto Trail was a good one, and I expect to begin knocking out additional sections in the near future. I definitely recommend taking your entire family at least to see Oconee Station and Station Cove Falls, and you could enjoy it any time of year.